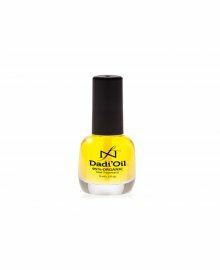 Dadi Nail Treatment Oil Products are available in-store and online from Dennis Williams Hair & Beauty Supplies. The 95% Certified Organic Nail Treatment from Dadi Oil is an innovative nail treatment which uses 21 essential oils to help strengthen and protect the nails. A favourite with nail technicians and salons everywhere, the strong and natural formula absorbs quickly and penetrates deeply, also moisturising the skin with a quick and non-greasy penetration. Working to enhance flexibility and prevent nail brittleness it also provides long lasting colour stability and essential shelf-life. Enriched nourishing oils that blend together to deliver flexibility, toughness and shine to the nail, this treatment distinguishes itself from others on the market, giving maximum strength and satisfaction to clients everywhere. The complete Dadi'Oil size range, available as a wholesale supply from Dennis Williams.